Milan private tour featuring the Duomo, Sforza Castle, and La Scala Museum includes: entrance fees to the sites you will visit and the services of a licensed Rome tour guide. 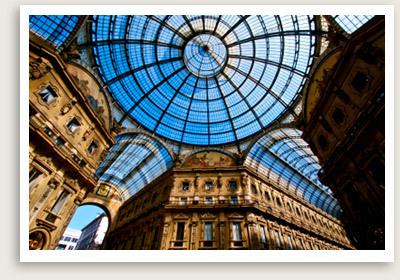 Milan Private Tours: Enjoy an all-day private guided tour of the historic city of Milan with a private expert tour guide. This private tour features Milan’s historic and artistic highlights, from La Scala to the Last Supper. You will start your tour with Sforza Castle (Castello Sforzesco), the former residence of the Duchy of Milan and one of Europe’s largest citadels. The castle now houses several of Milan’s finest museums and art collections, including the Brera Gallery. You will visit this gallery for a guided tour of the most important works from such Italian masters as Bellini, Tintoretto and Caravaggio. After a lunch break at the restaurant of your choosing, you will continue your guided tour at the Duomo. The city’s magnificent late Gothic cathedral, the Duomo features the tallest Gothic vaults of any church in the world. The Duomo also boasts the most extensive collection of marble statues, most notably the golden Madonna, which you’ll see on your way to the roof for an incredible view of Milan’s cityscape. Your private walking tour of Milan will continue through the Gallery Vittorio Emanuele II — known as the world’s oldest mall — to the square of La Scala, perhaps the world’s most famous opera house. You will visit to La Scala’s museum, featuring an extensive collection of antique instruments, including Verdi’s Sommer fortepiano and a virginal painted by Guaracino in 1667, and works of art related to the opera’s history.